Mother Nature has spared U.S. coastal cities from devastating hurricanes this season, but some local homeowners should brace themselves nonetheless. The cost of flood insurance for thousands of properties in South Hampton Roads soon could go up – significantly in some cases. Subsidies that have kept insurance costs down for many homeowners across the country will be phased out beginning Oct 1. And those discounts no longer will be transferable from owner to owner, which will add hundreds or thousands of dollars to the annual out-of-pocket costs for buyers of such homes. On top of that, the Federal Emergency Management Agency is redrawing flood zone boundaries. Houses that aren’t in a flood zone now might find themselves on the riskier side of the line once the maps are finalized in 2014. Those homes will have to be insured against flooding. Do I need Flood Insurance ? Question: We are exploring purchasing a home in Hampton Roads, Virginia. I know that that are certain areas in Hampton, James City County, Norfolk, Chesapeake, Poquoson, Va Beach, York County and other nearby areas are prone to flooding. How can I find out if a home I am interested in is in a flood zone ? How can I find out how much flood insurance will cost ? Answer: Quite a bit of Hampton Roads is in a flood zone and subject to flooding during tropical storms, nor’easters and even extremely high tides. The flood maps for Hampton, VA were recently redrawn, and the process is under way in Suffolk and Newport News. In Hampton, more than 1,700 properties and their structures were added to a new flood-hazard zone, while 2,568 were removed. An additional 2,734 properties were added to the new flood zone, but their structures remain outside the zone. The changes are scheduled to take effect by February 2011. What distinguishes flood insurance from home owners insurance is the source. The federal government’s National Flood Insurance Program makes the coverage available through private insurers and agents, who sell it and deal with claims. Conventional homeowners policies exclude any coverage for flood damage. Hampton Roads home buyers and others seeking information about the insurance should start with the National Flood Insurance Program’s Flood Smart website, www.floodsmart.gov. More detailed information about flood maps and flood-hazard zones is available from the Federal Emergency Management Agency’s Map Service Center website, www.msc.fema.gov. If you have a federally backed home loan, your lender may require it. Even if you aren’t required to have the coverage, it’s worth checking with neighbors and others about the flood risks where you live. Of the claims filed for flood damage, 20 percent come from homes outside zones designated as flood-hazard areas, according to FEMA. A quick way for determining the risk at a particular address is to use an interactive tool on the Flood Smart website. Fill out the "Flood Risk Profile" box on www.floodsmart.gov and get an estimate of your exposure. Flood policies are capped at a maximum amount of $250,000 for a home and $100,000 for the contents. Private insurers offer additional amounts for homeowners who already have coverage from a National Flood Insurance Plan policy. The deductibles are typically $1,000 for the building and $1,000 for the contents but can be higher. The program also provides coverage for renters, condo owners and owners of commercial property. Policy costs depend on your exposure to flood damage and how much coverage you buy. The annual cost of a standard policy with the maximum coverage for a single-family home and contents in a moderate-to-low-risk zone is $1,489. The cost of maximum coverage for certain policies in a moderate-to-low-risk area can be as low as $355, but the premium jumps to $5,700 a year for a home in a high-risk coastal zone. Flood insurance is available from most agents who sell homeowners coverage. The Flood Smart search engine for determining the flood risk of a property also lists agents who sell flood insurance. These agents use the same rates, deductibles and terms defined by the National Flood Insurance Program, so it doesn’t help to shop around for a lower rate. Flood zones describe the land area in terms of its risk of flooding. Everyone lives in a flood zone—it’s just a question of whether you live in a low, moderate, or high risk area. How do I find out whether or not a property in Hampton Roads is at risk of flooding, and if it is, at what level? Go to the website http://www.floodsmart.gov and fill out the Flood Risk Profile on the left hand site of the site. 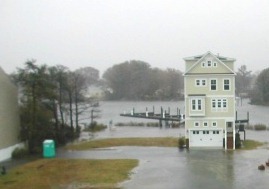 The site allows you to call up flood maps for the Hampton Roads and Williamsburg areas..